Clever marketing isn’t necessary for one of Carlos Ruiz Zafón’s books, but who can resist a free story? 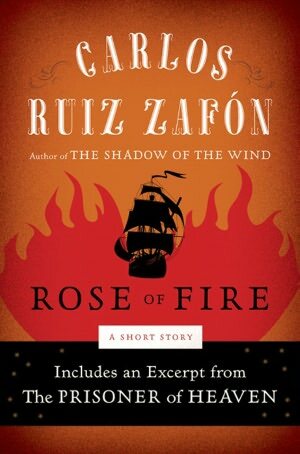 Rose of Fire, a Zafón short story, is a free download on iBooks, and ends not only with a tantalizing cliffhanger, but also continues with the first two chapters of Zafón’s latest Barcelona adventure – The Prisoner of Heaven – a tease that’s hard to resist. Rose of Fire reveals the origin of the Cemetery of Forgotten Books, the library from which a fortunate patron can take only one book in a lifetime. This secret repository is the premise for Carlos Ruiz Zafon’s novels: The Shadow of the Wind, its prequel The Angel’s Game; and now the sequel The Prisoner of Heaven. If you’ve read Shadow of the Wind, familiar characters reappear – Fermin Romero de Torres, friend and former spy, and Daniel Sempere, now grown and still at the bookstore. The Prisoner of Heaven is the continuation of Zafón’s Shadow of the Wind – more intrigue, mystery, and danger in a Gothic tale- masked by the politics of the Franco dictatorship. Zafón is one of my favorite authors and Shadow of the Wind is at the top of my books to recommend. The Prisoner of Heaven promises to continue the excitement, and, of course, I had to buy it after reading those first “free” chapters. This entry was posted in authors, books, history, mysteries, reading, short story and tagged Angel, Angel's Game, Barcelona, Carlos Ruiz Zafón, Franco, Francoist Spain, iBooks, Prisoner of Heaven, Shadow of the Wind, Shadow the Wind, The Prisoner of Heaven, Zafon. Bookmark the permalink. I hope you’ll enjoy The Prisoner of Heaven, Rosemary. I thought it was very good.